Letter to the Peel School District regarding installation of WiFi systems in the school district. Letter to the Los Angeles Unified School District regarding installation of WiFi systems in the school district. The previous article in this series described the relationship between the roll out of smart meters by utility companies and the roll out of the 5G cellular communication network that telecom companies are planning to install throughout the United States. If you don’t currently have one or more smart meters on your home, then be aware that plans are being made to change that situation for you. Please use this link to read the first article. In addition to smart meters collecting information for electric utilities, they may soon be used by natural gas providers and public water districts. Thus, some homes may eventually have three smart meters broadcasting electromagnetic radiation 24-hours a day. Utility companies want us to believe that their smart meters only broadcast information once a day or only once every 4 hours. This simply is not true. They actually broadcast intense levels of microwave radiation several times per minute – they never stop – up to 190,000 times per day. The following video by Warren Woodward records the constant pulsing broadcasts of a smart meter owned by Navopache Electric Cooperative in Arizona. I am not targeting this electric provider – they just happened to be the owner of the smart meter that appears in the following video. This is typical for all smart meter performance, though some are reported to have much higher levels of transmission. As you will see, microwave bursts are frequent and unpredictable. The term “density” describes the amount of electromagnetic radiation that passes through a square centimeter or square meter. The density is primarily determined by two factors: (1) the distance between a person and the source of the electromagnetic transmission and (2) the strength of the transmission at the source. This means that if a person is exposed to microwave radiation from two sources that have the same transmitting strength, but one source is close and the other is far away, then the nearer source will have much higher density. The higher the density – the higher the exposure. The higher the exposure, the higher the risks of harm to human health. Of course, the length of exposure is also important as is the specific frequency of the transmission. There are risks associated with both long-term continuous exposure at low levels and short-term high levels of exposure. 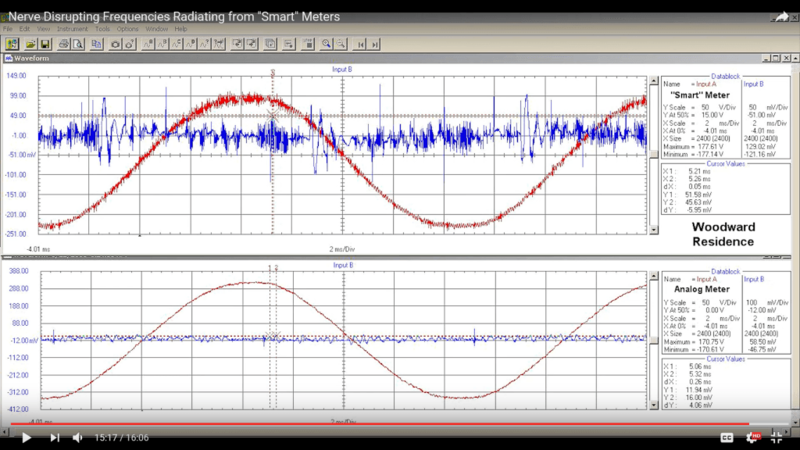 The preceding video clearly demonstrates that, based on proximity, the smart meters produce much higher microwave density than cell towers. People who have smart meters, for example, on their homes or even worse on the wall of a bedroom, are at serious risk, because the density of their microwave radiation exposure is much higher than from distant cell towers. We must wonder why the frequencies used in medical research to block nerve activity are also being added to electrical wiring by smart meters. Is it coincidence? The insertion of these kilohertz frequencies by smart meters into household wiring radiates into the environment as much as 6 to 8 feet from electric wires. This means that in a typical home, it is impossible to remove oneself from their effects. Every analog meter that remains in place stands as a beacon of freedom for those who are concerned about their health and wish to preserve independent thinking. 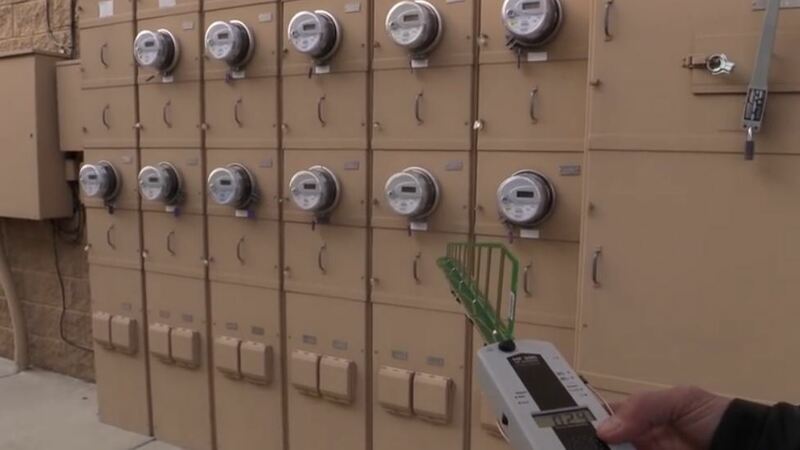 Yes, the smart meter system is that serious of a matter! The Pennsylvania Public Utility Commission recently decided a smart meter case in favor of the country’s largest public utility, PECO, an Exelon company. Note that Exelon is the largest utility in the Fortune 100 (see http://www.exeloncorp.com/ ). The case was based on a complaint against PECO by Susan Kreider, a Philadelphia resident reporting that she was injured by a PECO smart meter installed without her permission. Among the symptoms Ms. Kreider suffered after PECO installed a smart meter in 2013 were irritability, high blood pressure, migraine headaches, visual floaters, heart palpitations, sleeplessness and constipation. 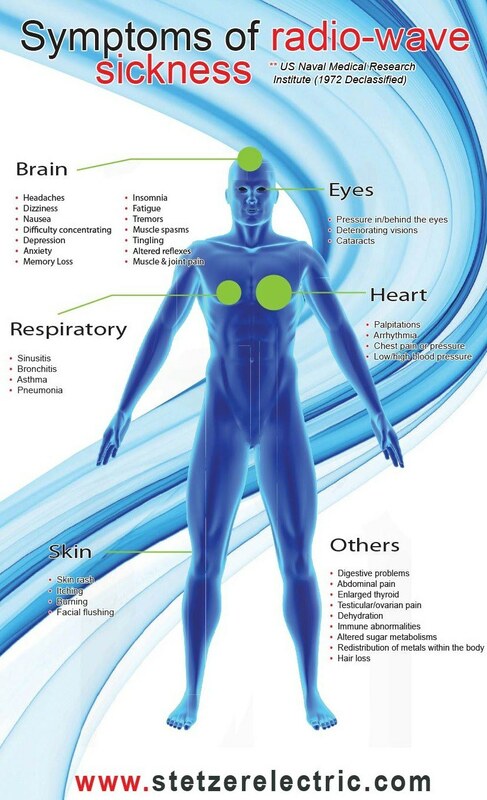 These are among the few of the many symptoms that can be experienced by people suffering from the EMF effects of smart meters. See http://emfsafetynetwork.org/smart-meters/smart-meter-health-complaints/ for a list of smart meter exposure symptoms. In 2014 Ms. Kreider hired a lawyer who drafted and sent a letter to Exelon demanding that they replace the offending meter. The PECO legal department dismissed her complaint out of hand, stating that they had nothing to offer except AMI meters. The evidence suggests they routinely do not address customers’ health issue - claiming the meters are required by law (so in their view no customer relief is necessary no matter what the circumstances). As PECO does not send out meter readers, Ms. Kreider self-reported her meter readings. After several months PECO decided a customer cannot be allowed to replace their smart meter with an analog meter and a shut-off notice was issued. Many of the smart meter resisters who have not allowed PECO to install a smart meter on their property have received these notices, and the ostensible reason for the notice is not allowing access to PECO’s meter (which according to the rules around meters is that the meters PECO deploys are not the customer’s property, but theirs, even though the customer pays for it). In addition, PECO began making more serious claims such as those of tampering and theft. Ms. Kreider’s State Senator, Shirley Kitchen, convinced PECO to abandon some of their more extreme allegations. Once the shut-off notice was received, one of the very few actions that can stop the process of a shut-off is filing a formal complaint (note that an informal complaint will not work) with the Pa PUC. Not having the resources to hire a lawyer, Ms. Kreider represented herself Pro Se. (4) that the Respondent did not seem to be accepting her monthly reading. PECO has full time lawyers to assign to smart meter cases and used a number of manoeuvers: A week before Ms. Kreider’s scheduled in-person hearing in Philadelphia they requested a short delay, due to the alleged illness of their lawyer. The day before the rescheduled hearing, they rushed a motion for Interlocutory Review to the PUC judge requesting the full Commission decide whether Ms. Kreider could be allowed to have her hearing. The motion was granted. Later the PUC decided that the in-person hearing could proceed. However, just before the now many times rescheduled hearing, Exelon/PECO sent a last minute motion to Ms. Kreider and the PUC judges requesting that they be allowed to be represented by their corporate lawyer from Washington DC who is not licensed in Pennsylvania. Once the hearing took place their panel of experts behaved in a highly partisan and biased manner. They provided only one side of the issue, a side that has been persuasively contested by many scientists and smart meter activists. While it is not surprising that PECO’s experts were biased, what was surprising was that the PUC appeared to rely entirely on their testimony while dismissing the evidence of the experts cited by Ms. Kreider. Ms. Kreider is a Registered Nurse in Pennsylvania who has thoroughly researched the issue of EMF exposure. She lacks financial resources to pay expert witnesses to appear in person, however, she supplied abundant documentation on the health effects of EMF including references to testimony by experts who did not appear in person. Another part of Ms. Kreider’s complaint had to do with refusal of PEECO to use the customer supplied readings from her analog meter. Based on her readings, they were routinely overcharging compared to her readings. PECO refers to the replacement analog meter as a “rogue meter.” Their engineer alleged that the meter is dangerous and inaccurate. Among the arguments the expert used was a very old FCC standard based on thermal effects, not those which cause illnesses such as cancer. However, the evidence indicates it is Smart Meter that is dangerous and inaccurate, as corroborated by industry engineer whistleblower at https://takebackyourpower.net/smart-meter-fires-2016-video/. The meters contain serious safety flaws resulting from cost cutting decisions and have a propensity to cause fires. The PUC decision in Ms.Kreider’s case inaccurately claims the intent of the smart meter enabling legislation, known as Act 129, was to impose smart meters on all utility customers without exception, with no opt-outs. Investigation by PASMA, a Pennsylvania anti-smart meter organization, uncovered transcripts of debates in the Pa legislature and the debate record indicates that their claims are false. 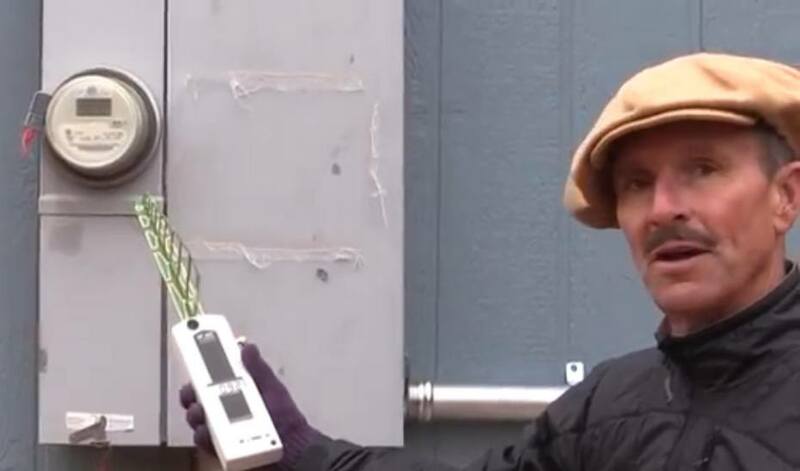 See http://www.activistpost.com/2015/04/conflict-of-interest-smart-meter.html for documentation of this. In addition to the use of clearly partisan experts, another troubling development was the interference in the judicial decision process by a Pennsylvania State Representative with ties to PECO. Ms. Kreider and other anti-smart meter activists believe that the PUC was unduly influenced by the extraordinary interference of State Representative Godshall. The Commission’s 2015 decision allowing Ms. Kreider’s complaint to proceed to a hearing favored the Complainant. Then, presumably at PECO’s behest, Representative Bob Godshall improperly intervened when he contacted Commissioner Gladys M. Brown in correspondence dated October 7, 2015, failing to copy the Ms Kreider who, incidentally, is not a Godshall constituent. Rep. Godshall’s son is on the PECO payroll and was previously in charge of the Pennsylvania Smart Meter installation program. It appears that Rep. Godshall’s letter contained egregious misrepresentations regarding Ms Kreider’s analog meter, including the statement that it endangered the grid. Evidence shows that it is the Sensus Smart Meters deployed by PECO that endanger the grid as well as personal property and safety. In fact, PECO had to remove 186,000 meters deployed in 2012 due to their propensity to cause fires. As Chair of the Consumer Affairs Committee, Rep. Godshall has intervened in multiple House & Senate Bills calling for smart meter Opt-Outs since 2012. Complainant argues that Rep. Godshall’s behavior as a public official warrants investigation for a violation of ethics. In summary, it appears the PA PUC acceded to external corporate pressure in deciding a claim regarding significant health effects of utility installed technology in favor of the largest utility in the US and against a complainant who not only supported her case with compelling evidence, but who currently already suffers a significant disability. It would appear that the PA PUC is a captive agency of PECO and does not represent consumers’ interests as their mandate requires. In the article Ms. Kreider indicates she will go off the grid if she needs to rather than compromise her health.